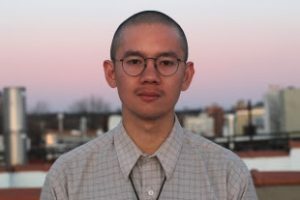 LAS VEGAS (May 31, 2018) – The Neon Museum has selected Karl Orozco as its 2018 National Artist in Residence. Orozco, a Filipino-American printmaker, illustrator, comic artist, and educator, creates work that grapples with the legacy of colonialism and seeks to challenge assumed notions of race, family, migration and power. Orozco will fulfill his residency over eight weeks this summer, from July 2 – August 25. An artist’s reception will be held at Nevada Humanities Program Gallery on Thursday, July 5, from 6 to 9 p.m. and an open studio event will take place from 6 to 9 p.m. Friday, Aug. 24, at the Neon Museum’s Ne10 Studio, 770 Las Vegas Blvd. North in Las Vegas. In a field of more than 50 applicants, Orozco was chosen due to his affinity for signs, storytelling and fostering meaningful connections with people. During his residency, Orozco will present “Come You Back to Maynila Bay,” a community engagement printmaking project using hand-carved linoleum mahjong tiles to retell family narratives of his grandmother’s underground gambling den in the Philippines. Alongside interviews with his “Lola” (Tagalog for “grandmother”), historical research into post-World War II Philippines and references derived from the Neon Museum’s collection of Las Vegas neon signs, Orozco will design and create signage welcoming museum visitors to a reimagined space mimicking his grandmother’s 1950s underground mahjong parlor. Currently a museum educator and teaching artist for the Queens Museum in New York City, Orozco teaches sequential art, printmaking, animation and portraiture to middle-school students. He graduated from Oberlin College with a Bachelor of Arts degree in Visual Art and Sociology. One of Orozco’s lasting legacies is the Asia America Art Collective, a biennial arts symposium featuring artists from the Asian/Pacific diaspora. His commitment to the Filipino- and Asian-American community is further evident in his graphics and printmaking work. Orozco creates promotional materials for racial justice organizations such as the Asian Arts Initiative, 18 Million Rising, and Anakbayan New York-New Jersey, a Filipino youth organization. He believes that artists are key in engaging audiences outside of social movements, serving as interpreters for complex and difficult topics. In 2011, Orozco received an Oberlin Shansi In-Asia research grant to create a serigraph suite The Philippine Scene which detailed his first trip to his motherland Philippines. He later became an Oberlin Shansi Teaching Fellow in Banda Aceh, Indonesia, where he taught English literature and storytelling at Syiah Kuala University and organized Akar Imaji, an arts and community organization that holds free after school art classes and provides spaces and opportunities for young Acehnese artists to connect and showcase their creativity. Founded in 1996, the Neon Museum is a non-profit 501(c)3 organization dedicated to collecting, preserving, studying and exhibiting iconic Las Vegas signs for educational, historic, arts and cultural enrichment. It has been ranked No. 1 in Las Vegas Weekly’s list of “Twenty Greatest Attractions in Las Vegas History.” For more information, visit neonmuseum.org.